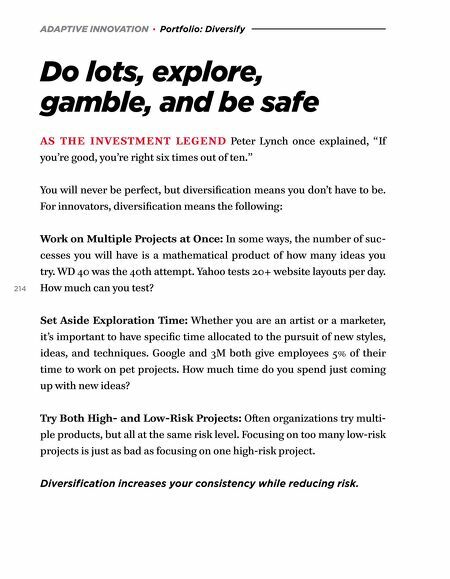 ADAPTIVE INNOVATION · Portfolio: Diversify Do lots, explore, gamble, and be safe AS THE INVESTMENT LEGEND Peter Lynch once explained, "If you're good, you're right six times out of ten." You will never be perfect, but diversification means you don't have to be. For innovators, diversification means the following: 214 Work on Multiple Projects at Once: In some ways, the number of suc- cesses you will have is a mathematical product of how many ideas you try. WD 40 was the 40th attempt. Yahoo tests 20+ website layouts per day. How much can you test? Set Aside Exploration Time: Whether you are an artist or a marketer, it's important to have specific time allocated to the pursuit of new styles, ideas, and techniques. Google and 3M both give employees 5% of their time to work on pet projects. 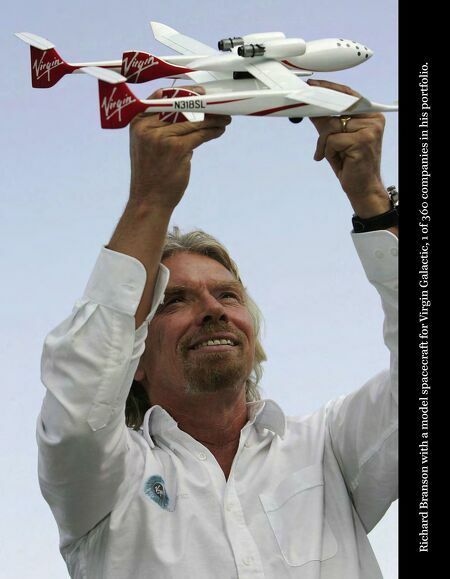 How much time do you spend just coming up with new ideas? Try Both High- and Low-Risk Projects: Oſten organizations try multi- ple products, but all at the same risk level. Focusing on too many low-risk projects is just as bad as focusing on one high-risk project. Diversification increases your consistency while reducing risk.